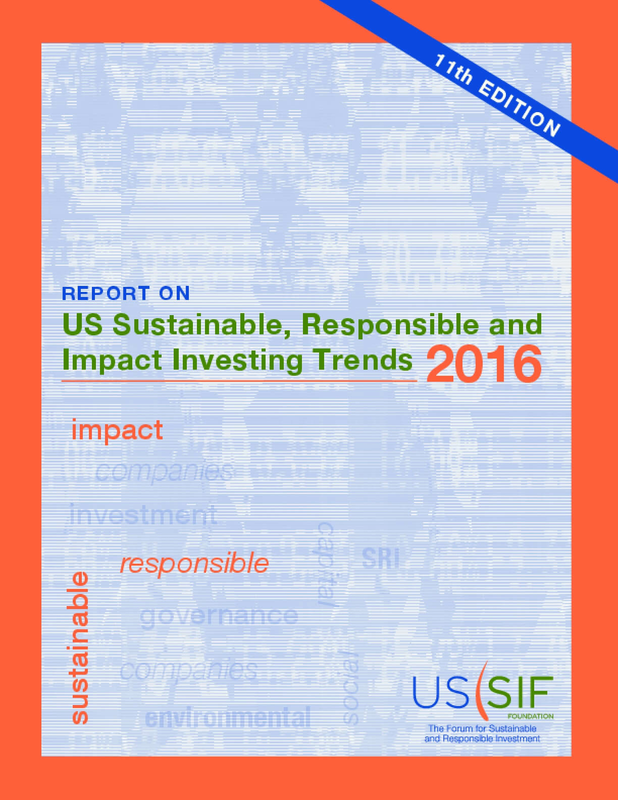 US sustainable, responsible and impact (SRI) investing continues to expand. The total US-domiciled assets under management using SRI strategies grew from $6.57 trillion at the start of 2014 to $8.72 trillion at the start of 2016, an increase of 33 percent, as shown in Figure A. These assets now account for more than one out of every five dollars under professional management in the United States. The individuals, institutions, investment companies, money managers and financial institutions that practice SRI investing seek to achieve long-term competitive financial returns. Some investors embrace SRI strategies to manage risk and fulfill fiduciary duties; many also seek to help contribute to advancements in social, environmental and governance practices. SRI investing strategies can be applied across asset classes to promote stronger corporate social responsibility, build long-term value for companies and their stakeholders, and foster businesses or introduce products that will yield community and environmental benefits. * $2.56 trillion in US-domiciled assets at the beginning of 2016 held by 225 institutional investors or money managers that filed or co-filed shareholder resolutions on ESG issues at publicly traded companies from 2014 through 2016. After eliminating double counting for assets involved in both strategies and for assets managed by money managers on behalf of institutional investors, the overall total of SRI assets at the beginning of 2016 was $8.72 trillion, as shown in Figure C. Throughout this report, the terms sustainable, responsible and impact investing, sustainable investing, responsible investing, impact investing and SRI are used interchangeably to describe these investment practices. After eliminating double counting for assets involved in both strategies and for assets managed by money managers on behalf of institutional investors, the overall total of SRI assets at the beginning of 2016 was $8.72 trillion. Throughout this report, the terms sustainable, responsible and impact investing, sustainable investing, responsible investing, impact investing and SRI are used interchangeably to describe these investment practices. The assets engaged in sustainable, responsible and impact investing practices at the start of 2016 represent nearly 22 percent of the $40.3 trillion in total assets under management tracked by Cerulli Associates. From 1995, when the US SIF Foundation first measured the size of the US sustainable and responsible investing market, to 2016, the SRI universe has increased nearly 14-fold, a compound annual growth rate of 13.25 percent. Copyright 2016 by US SIF Foundation. All rights reserved.